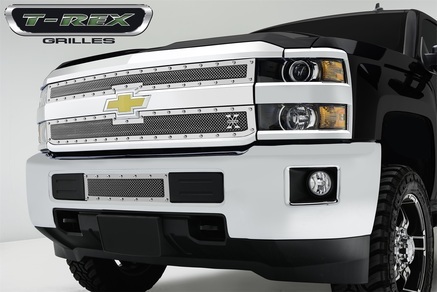 T-Rex Billet Buyer's Guide - Truck Grilles, LED Grilles & More! When you're walking away from your truck, and look back at it- what do you see? 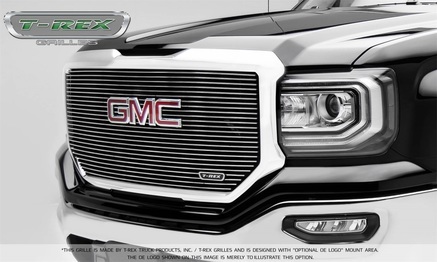 If it's a T-Rex grille, you're probably smiling from ear-to-ear. 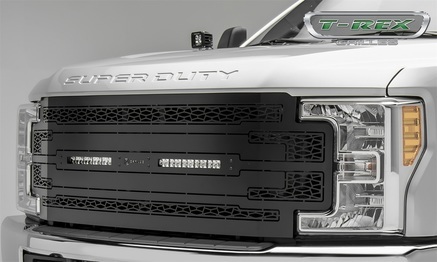 With an impressive number of grille options available, all will wake your truck's front-end to the next level. For that classic grille style that will make your vehicle stand out, this grille insert is a great choice. Made from tough material, it is guaranteed to last you for years and at the same time, you won't have a hard time installing this. 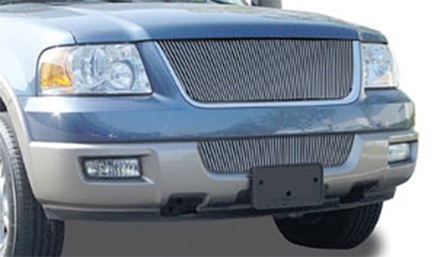 This bumper grille gives your vehicle that edge that you've always wanted! This 2-piece grille will give you a distinct style that will make your vehicle stand out on the road. A grille that is ideal for those who are looking to make their vehicle look more aggressive with that gleam thanks to its polished finish, this is exactly the perfect choice for you. 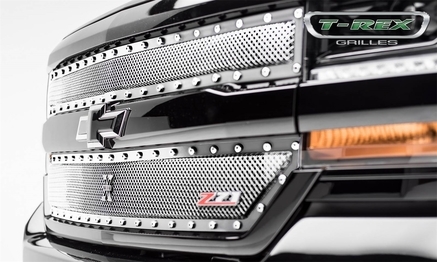 For that awesome addition to your vehicle's front end, this grille insert takes it to another level adding elegance and a personal touch that will make your vehicle stand out. Its polished finish gives you that bling - enough to make others look twice and make your vehicle look amazing out there. 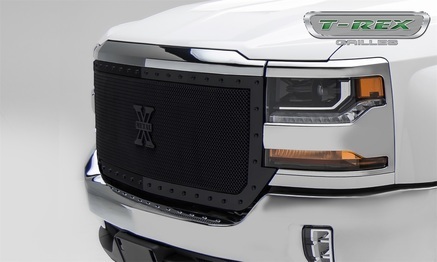 When it comes to billet grilles, only trust the best brand and T-Rex is definitely the best go-to brand if you're looking to pimp your ride. 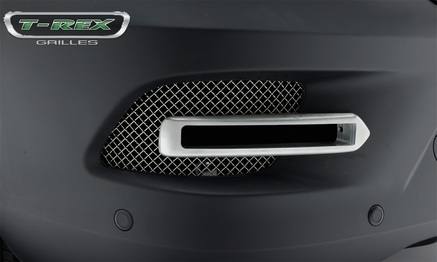 With this grille insert, you get to enhance the overall appearance of your vehicle just by adding it to your front end. It's that easy to look good! For the instant upgrade to your vehicle's physical appearance, you don't have to shell out a lot of money and you also don't need to exert too much effort because with this grille, you get that much-needed style that you will love. A practical addition to your vehicle, this is something that you will not regret! If you're looking for high quality grille that will transform your vehicle, this is the perfect grille for you. No need to spend money on other accessories because this will create the kind of impact that you want. You get added style and protection that will last you for years! 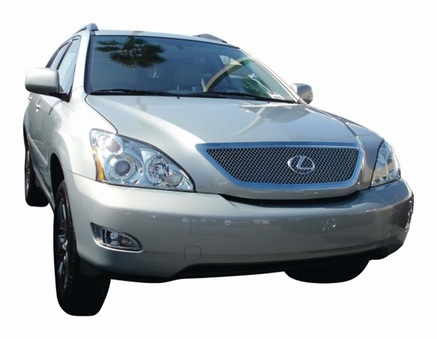 The design, quality and affordability of this grille makes it a practical choice if you're looking for a way to beautify your vehicle's front end. You get an instant upgrade with this without having to spend a lot of money. Plus, you don't need to cut or drill just to have this installed! 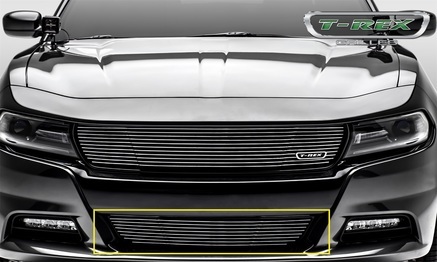 Protect your front end from road debris and at the same time, give your vehicle its much-needed style boost with this grille insert. Its tough construction guarantees that you will get the best out of it for many years to come, giving you the best value for your money that you will appreciate. Nothing brings stealth style but this grille. Its black powder-coat finish and its make gives your vehicle a more aggressive look that will truly make you stand out out there. It is also designed with black studs for that all blacked out look that complements almost all types of vehicles. 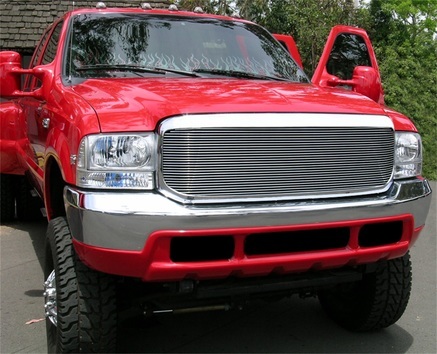 If you're looking for a way to turn your truck into something more aggressive, then this grille will definitely get the job done. 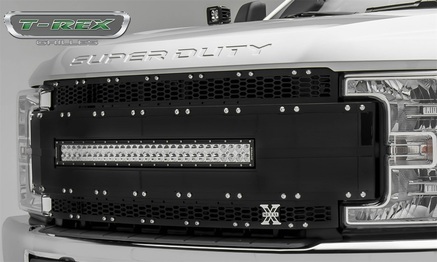 Plus, its 30" LED light bar adds to its style and provides you with a layer of safety while you're on the road. This T-Rex grill is something that you should not pass on! For class and sophistication added to your vehicle, this is the grille for you. 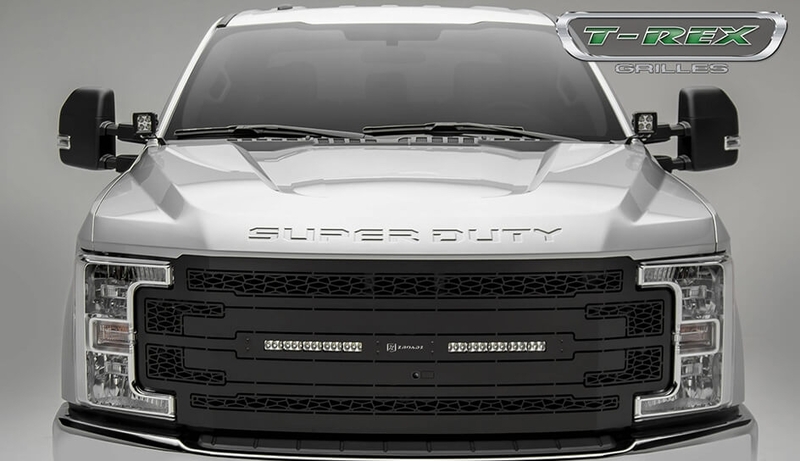 Your front end will definitely look so much better and you are guaranteed the highest of quality that is worth it and at the same time, you won't have a hard time installing this grille. It's a great choice for anyone looking for more elegance. It's time to add a sophistication to your car without having to spend a lot of money. 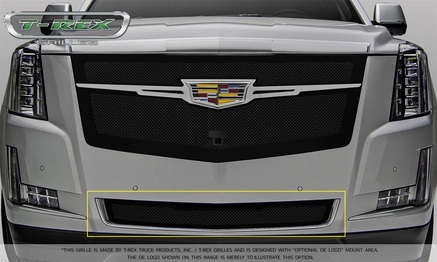 This 6-piece grille insert will give you the elegance that you need and at the same time, protect you from the harmful debris that could potentially scratch your front end or your entire vehicle. With this, you are making the right choice. 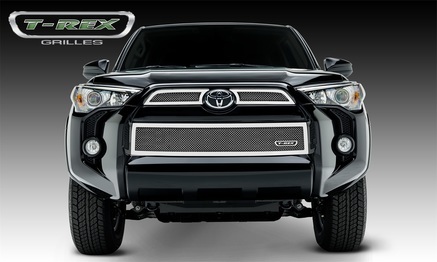 This 2-piece grille will give your vehicle's front end that distinctive look that will make it stand out. 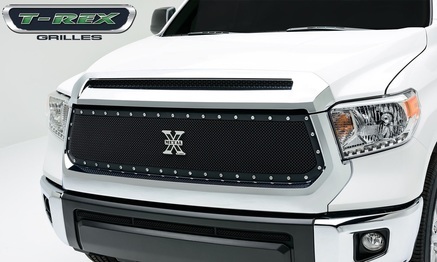 To make it even more an eye candy, the X-Metal studs that surrounds the grille just gives that right kind of gleam. Installing this is very easy as well & you will have it ready in no time! For a more distinct look to your vehicle, you are going to love how this baja bars on your grille can give it a unique look. Made from tough stainless steel, this grille will not only boost the appearance of your vehicle but will also give you more protection. The studs, the gleam, and the precise fit -- this insert will truly bring out the best in your vehicle. You will be surprised how a simple addition to your front end can make a huge difference and it's something that you will definitely love. 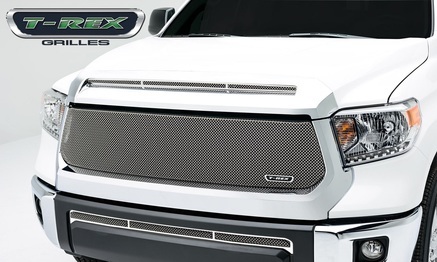 With this grille, you are going to stand out! For more personality to your vehicle that will also provide more illumination for you on the road, this is the perfect grille for you. Constructed from tough material, this guarantees that it will be of service to you in many years to come. So, if you want protection and uniqueness, this grille is the right one for you! PartCatalog is proud to be an authorized retailer for T-Rex Billet products. As an authorized retailer, all orders from PartCatalog will come with the full manufacturer's warranty. For more information on T-Rex Billet, please visit the T-Rex Billet official website.